Rustins Textured Decking Oil contains agents to improve the slip resistance in wet and dry conditions on exterior timber decking and timber walkways. 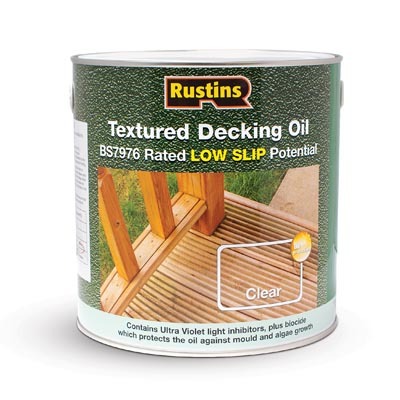 Rustins Textured Decking Oil is independently tested and rated as ‘low slip potential’ according to BS7976, Part 2, 2002 assessment of slip resistance. It contains UV absorbers and biocide to protect the oil from mould and will allow the natural beauty of the wood to show through. Available in 2.5 litre clear only. A blend of oils, resins and driers, with added UV absorbers and biocide to protect the oil from mould. Added texturing agents to provide a low slip (or anti slip) potential surface in wet and dry conditions. Brings out the natural beauty of wood. 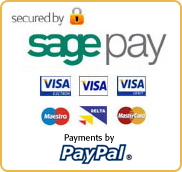 Easy to apply and maintain. Cured surface finish rated as "low slip risk potential" according to BS 7976, Part 2, 2002; Assessment of slip resistance in both dry and wet conditions. The bare wood must be clean, smooth, dry,and free of dust and contaminants. Oily woods such as Iroko and Teak will also require washing down with white spirit to remove natural wood oils which prevent absorption of Rustins Textured Decking Oil into timber, causing loss of adhesion. Do not apply to damp timber as this will prevent the oil from penetrating the timber and adhering causing it to flake off. Ensure product is stirred well and shaken before use. Apply liberally witha clean brush allowing 4 - 8 hours between coats. Do not apply if rain is expected. 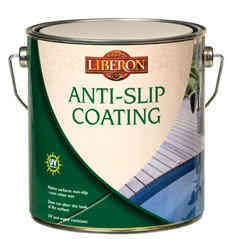 3 coats must be applied on bare untreated timber to develop optimum slip resistance. Rustins Textured Decking Oil may be applied over an existing oiled finish, in which case one coat should be sufficient as a top dressing. Periodic re-oiling is required. When applying to previously oiled wood the surface should be cleaned thoroughly and be free from contaminants. 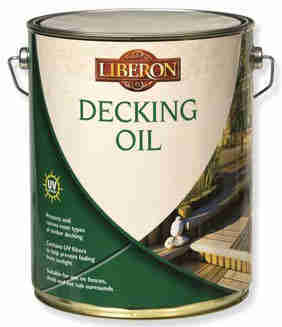 Liberon Decking Cleaner, Liberon Garden Furniture Cleaner, and Rustins Advanced Wood Preserver Clear.